St. Pierre American Presidential Edition Horseshoe Set with Wood Case Giveaway. I was always terrible at horseshoes, but I always played. It's fun and challenging. I used to love horseshoes, but I haven't played in ages. I need to get a set like this so my boys can play! This is a really nice horseshoe set. I've never seen one quite this fancy. This reminds me of when I was a kid and we used to play horseshoes. What a cool concept this is, thanks for sharing, I have to bookmark this page for sure. What I like about horseshoes is that close counts. What a great game to have during the upcoming holiday where family comes together. I've not played in years and wonder if my aim would be any good. I haven't played horseshoes in years! I think it would be a super fun family activity though! Looks like a great set indeed. And yeah, even those not so young people can play haha been a while since I played it. What a great giveaway! My husband would love this! We have a horse shoe game, but sadly it has never made it to the yard. I remember playing when I was younger and it was so much fun. My town is called the heart of thoroughbred country, big on horses we used to love collecting the shoes and play with them. I haven't played horseshoes in years! What a fun giveaway! I haven't played horse shoes in forever. We use to play all the time. 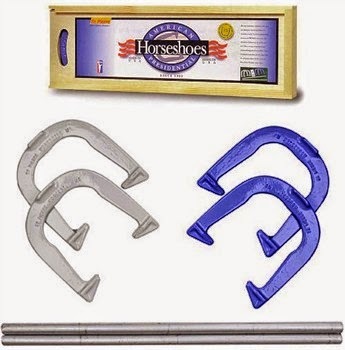 Horseshoes brings back such memories of my childhood. My brother's grandfather had a garage and they had a horse shoe pit in the back. I remember watching everyone play. I love reminders of classic games like this .... never would have thought about it but I think my son would love this game!! I haven't played horseshoes in years. This giveaway brings back such fun childhood memories though! This would be fun for the entire family. This is a great giveaway and good luck to those entering. We used to play horseshoes on the holidays. It's a fun family game.